The last item for the day was Nava Brindavana. Normally at this time of the year the river would be flowing and a trip to the holy spot would involve a boat ride from Anegundi or Hampi. However this year with less rainfall, water was being stocked at TB Dam and there was hardly any flowing water few days back. Our guide Thimma from Anegundi village said dam authorities released water 2 or 3 days back, we were lucky to be seeing flowing water. Water wasn't deep enough for boats, so we will be going by foot. 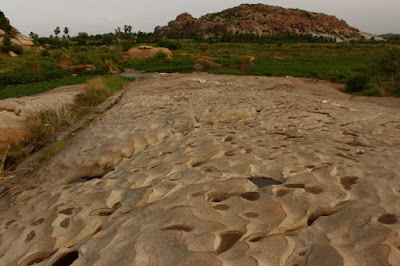 From Anegundi, would be a 600 meters trek on the riverbed. The path has three landmarks- first we pass by Sri Krishnadeveraya's tomb, then a big rock bed on which is Suryanarayana temple and a dolmen. 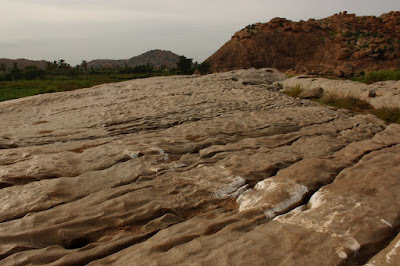 Next comes the second rockbed which has is silvery white color. More than the color its surface is breathtaking.. like sea waves. The sight is amazingly beautiful. It was around 5 PM, sun was still high. Wonder how it looks when Sun is low, say 7 in the morning. The golden red rays would have a magical effect. In bird's eye view the rock is an obtuse triangle, about 120 meters at its longest and 40 meters at its widest. Treading barefoot on this surface was a new experience for me.. smooth, slippery and piercing. 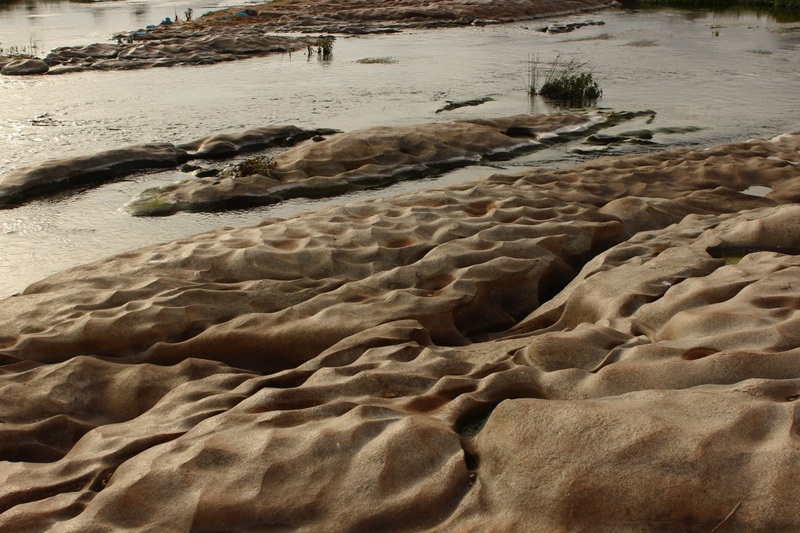 This is the first time I'm seeing such a surface, makes me wonder how this was formed. Obviously water movement but there are so many places where water has sculpted rocks but nothing quite like this. 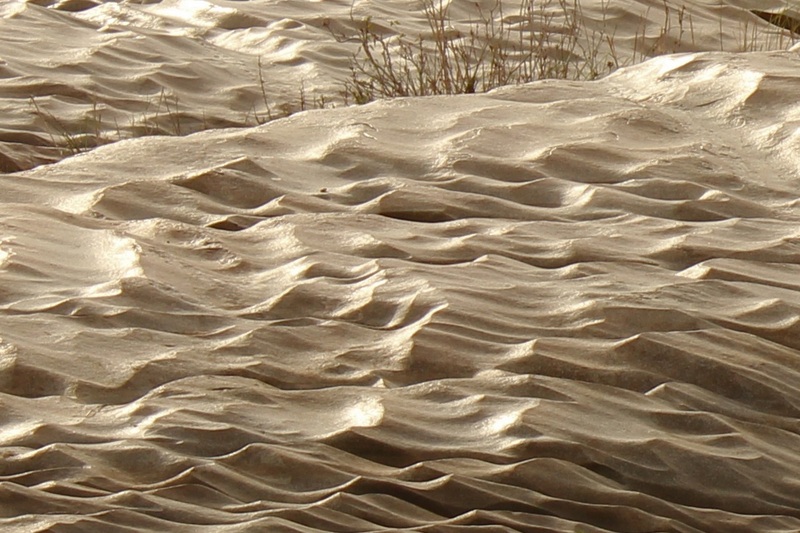 Besides waves there are deep grooves too. Simply amazing! The grooves are parallel, flowing in one direction. 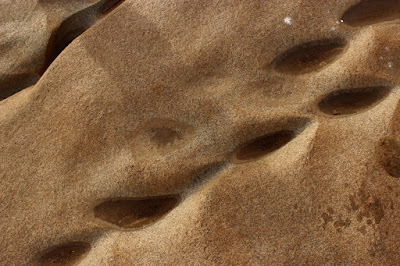 Was it sand-water mixture that carved these grooves and polished these surfaces? Then there are pits too. Is this stone softer compared to other stones? The color of this stone reminds me of Mudgal granite. 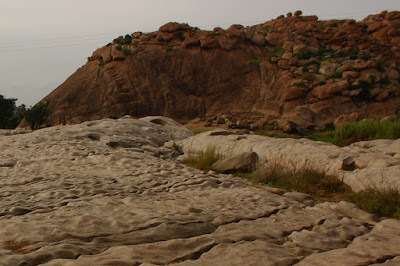 Mudgal is a historic village in Raichur district. The stone is covered with horizontal lines, as thought lot of rectangular blocks were joined together. The largest pit of this rock. The pit's bottom wider than its mouth. The pit's bottom was sandy. I guess the bottom is not flat but curved, like a bowl. Oh the creations of Nature. In this view, the ridges' are darker, brownish. This reminds me of Google Terrain map. Pair of grooves form a row of teeth. It would be interesting to see water flowing on this rock.. graceful turns and twists, creating its own ragas. Imagine the sight in moonlight.. it would be mesmerizing. A row of similar shaped pits. 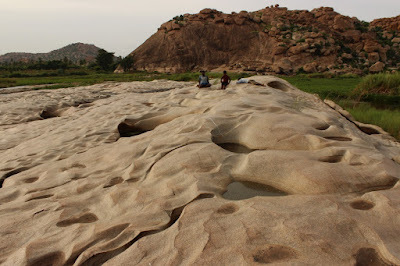 Next time when I'm in Anegundi, I'll shoot these stones in all possible light. If possible I'll plan a trip during full moon. 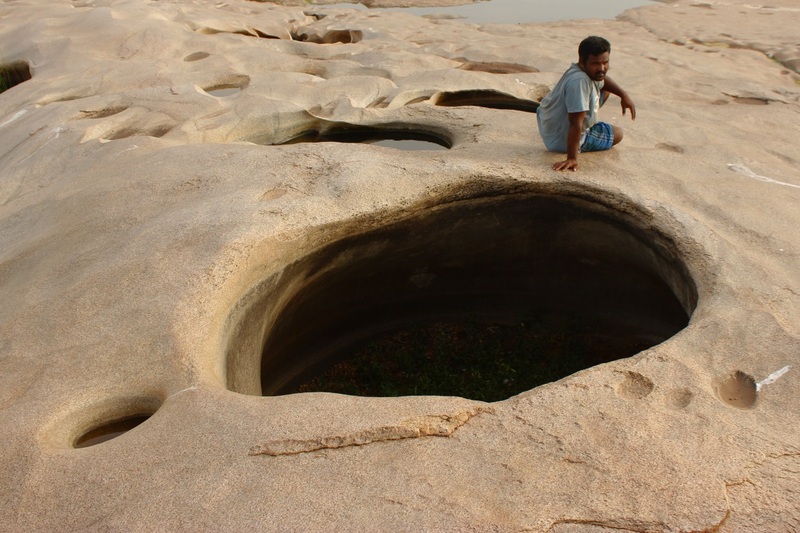 Hampi and Anegundi, hope to see you soon. 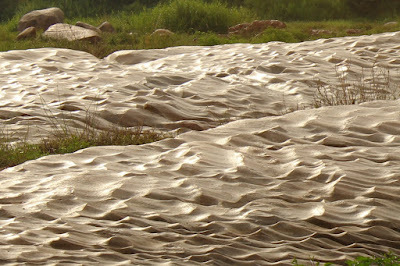 Beautiful, first I thought it is river water flooded by rain, later realized it is land formation or sand. It is beautiful. I have not seen flowing clear water even in USA like in Japan. Japan has very clean flowing water. Iceland could be very clean my guess. Photos of the glistening rocks make them appear as real waves of water. 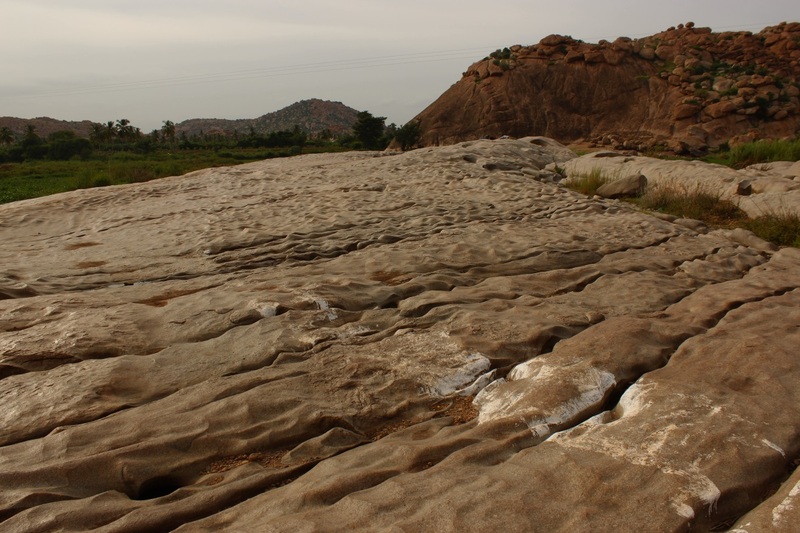 This is an exceptional geological site, I am thrilled to discover from you and badly want to visit :) I don't know if I will ever get to see it as this, and can't prey that there should be no water, just so that I can see it so! 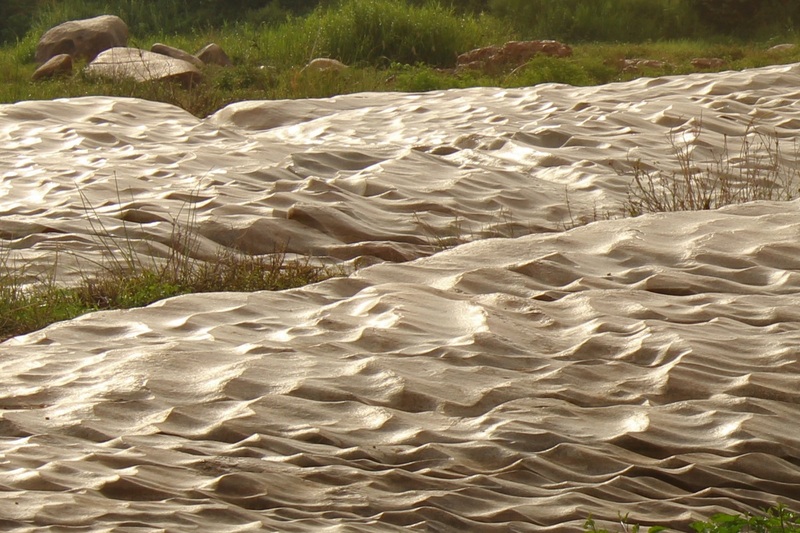 @Raj - yeah, the first picture, at the first look, seems like waves in water. 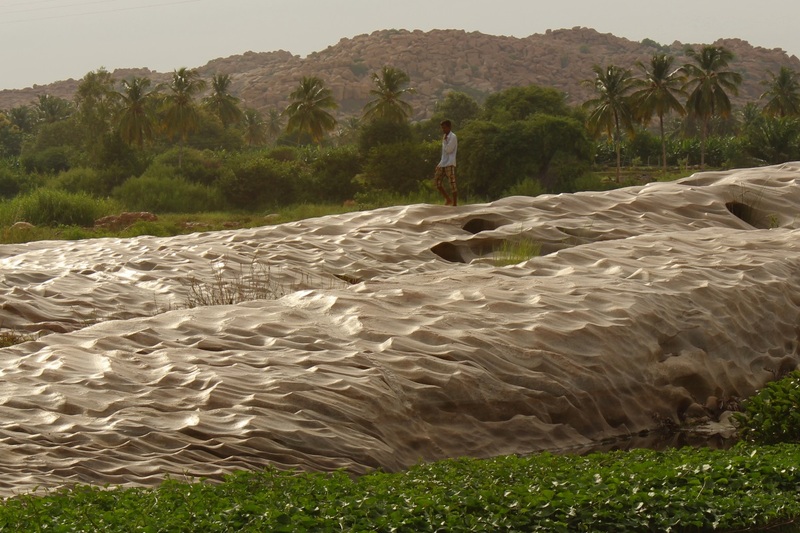 Water's colorlessness depends on the type of terrain/soil its flowing on. Water flowing through black soil is the darkest, especially when its shallow. deep waters are usually clear at the top. 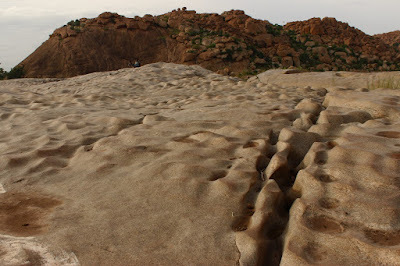 @Nikhil - agree with you, truly an exceptional geological site. would be interesting to explore the riverbed, might find more unique rock types. 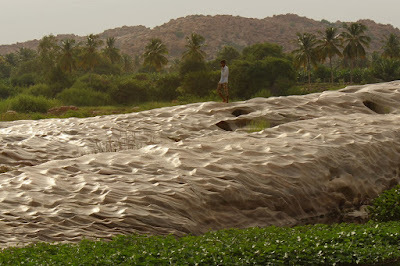 If you plan your visit during Dec - Mar you have good chances of seeing this spot because the waters are held at TB Dam, Hospet. However, we should keep wishing for flowing rivers.. This is truly an incredible sight! Yes I have to come back to Anegundi!